And ever since Sutterluety and her colleague Diann Caviness were awarded a VBEF grant in November, Kempsville Middle School (KMS) students have been involved creating products and presenting their work using a green screen, studio lights, tablet tripod stand, wireless microphones as well as iMovie and Green Screen apps purchased through the grant underwritten by Damuth Trane and Kiwanis Club of Norfolk Foundation. 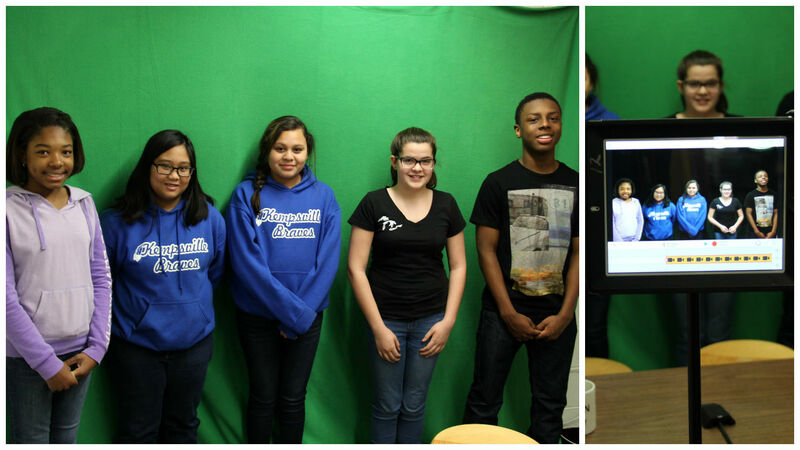 Most recently, the school’s diversity club produced videos for a project called “A Moment in African American History.” Students appear with green screen images of Jackie Robinson, Maya Angelou, Neil deGrasse Tyson, Oprah Winfrey, Colin Powell and others to highlight their accomplishments during the national month of recognition. The videos are being shown on the school’s morning announcements throughout February. 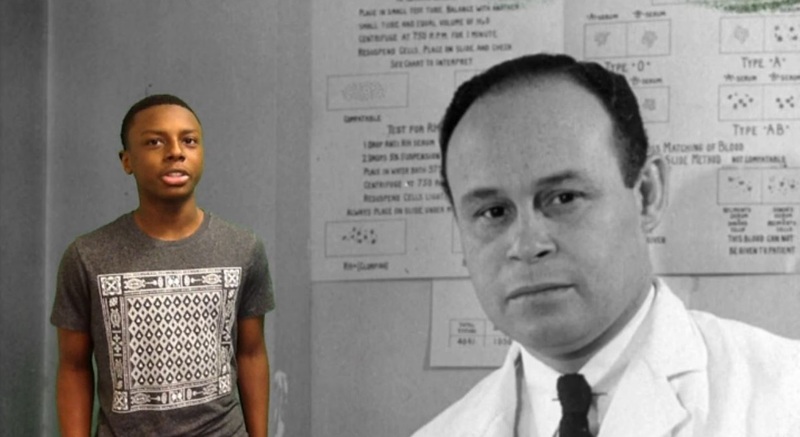 In his video, KMS eighth-grader Tairel Fuller spoke about Dr. Charles Drew, an African American surgeon who pioneered medical research in the 1930s to discover ways to process blood for transfusions and store in blood banks. Fun, but not without its challenges. “If you were standing in front of the person’s face, you had to move to the side so you wouldn’t block the picture,” added Fuller. Eighth-grader Lauren Sutton learned this lesson while producing a green screen video for Sutterluety’s English class for literature related to World War II. 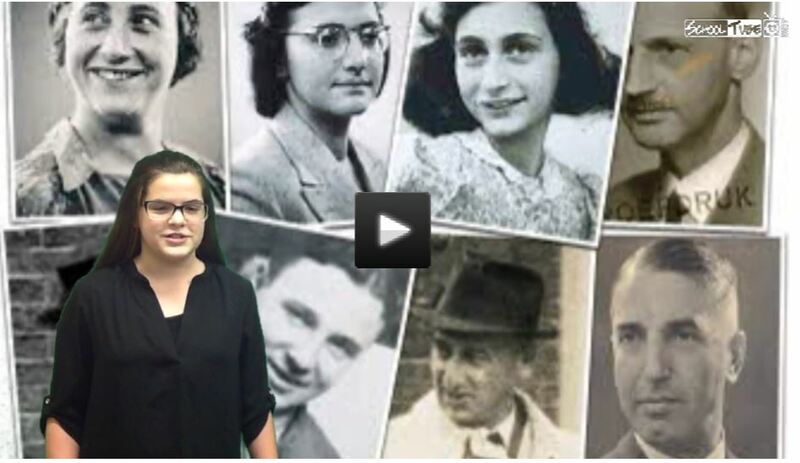 She worked with a team of classmates to write, anchor, direct, film and edit a 60-second history tutorial about Meip Geis, who hid Anne Frank and her family during the war. Throughout the team’s video, available on School Tube here, Sutton had to shift to the left, right and center according to the video’s eight changing images she could not see projected on the green screen while she was speaking. Students engaged in authentic production, collaboration, evaluation and problem solving – just as Sutterluety hoped. The unique video production also allowed Sutterluety to experiment with instructional models as well. Having taught the eighth-grade unit on historical fiction for 10 years, which uses the play version of Diary of Anne Frank and Night by Holocaust survivor Elie Weisel, Sutterluety was well aware of the historical topics with which students typically struggled. In addition to the instructional benefits, students are more attuned to green screen technology when watching television and movies. 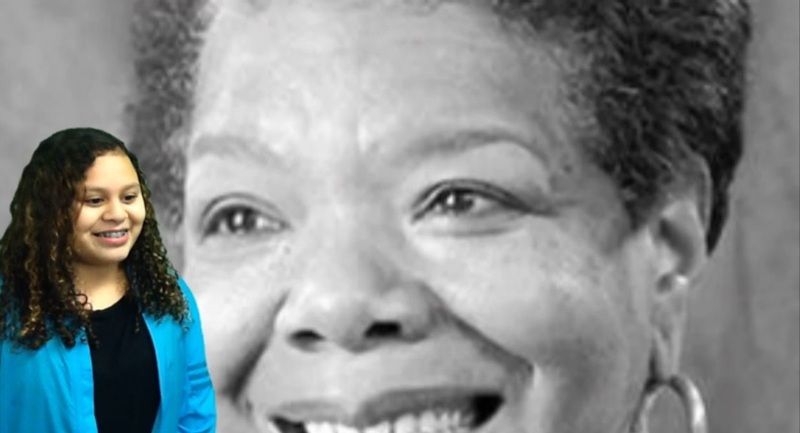 “I’ve noticed on the news with weather and on different shows when they are pretending to sky dive or something, they use different backgrounds,” said eighth-grader Kathy Ramos who highlighted Maya Angelou in her African American History Month video. Students agreed that television weather meteorologists could probably relate. Sutterluety hopes more teachers can relate and will take advantage of the technology, noting Earth Science and PE/Health as examples. Sutterluety admits she is not a fan of PowerPoint presentation software and is excited to explore new opportunities to use green screen technology in her new role as a library media specialist at KMS, a position she transitioned to in late fall. She points to a section of empty bookshelves in the library she hopes to remove and convert into a green screen production area. It is an opportunity for which she is grateful. “The Virginia Beach Education Foundation continuously makes sure that we’re able to do fun things, creative things and kind of hook the kids into learning using their authentic technology – not traditional media but their technology,” said Sutterluety. To learn more about Virginia Beach Education Foundation (VBEF) grants and how individuals, community organizations and businesses are supporting teaching and learning through the VBEF, visit www.vbef.org or contact VBEF coordinator Debbie Griffey at debbie.griffey@vbschools.com. The 2015-16 VBEF grant projects and underwriters are featured in a booklet available online. I am so proud of our daughter-in-law Mary Sutterluety she excels at what ever she does. Mary’s face lights up when she talks about education she is such a strong advocate to children leaning and I am so proud to have her in our family, we love her dearly.